Texas fights giant salvinia with floating booms, herbicides and special weevils. ﻿﻿In November 2015, fisheries biologists at the Texas Parks and Wildlife Department received a most unwelcome piece of news. Giant salvinia had been spotted in Lake Fork, a popular bass-fishing lake in East Texas. 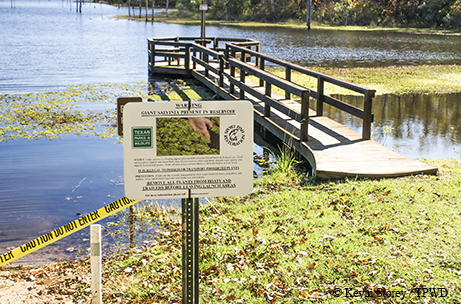 The invasive South American fern has been a known threat in East Texas; TPWD and its partners have spent a decade fighting infestations on Caddo Lake and Toledo Bend Reservoir. They know it’s important to act quickly because giant salvinia can spread with devastating speed. Rushing to investigate, biologist Kevin Storey and his crew found 3.25 acres of giant salvinia at the back of Chaney Branch, west of the Lake Fork dam. The community sprang into action. The Sabine River Authority closed private boat ramps at Chaney Point South and Secret Haven. More than 1,000 feet of floating boom, the type that’s used to contain oil spills, was placed in the water in an attempt to confine the infestation. TPWD staff applied herbicides in November and February. As of this spring, crews hadn’t found the noxious plant growing anywhere else in the reservoir. But this recent invasion of a favorite fishing lake serves to remind us all that Salvinia molesta is a threat to reckon with. The rootless fern floats on the water, forming dense mats of vegetation that hinder access to boat ramps and block the sunlight that drives the underwater food chain. It reproduces by budding. One broken stem on a boat trailer can start a new population. Under favorable conditions, a colony can double in size every two weeks. Don’t spread it! “Clean, Drain and Dry” your boat and trailer to avoid carrying aquatic invasives to new waters. Report it! If you see giant salvinia in an area not already known to be infested, call the nearest TPWD fisheries management office or use the online report form at texasinvasives.org.